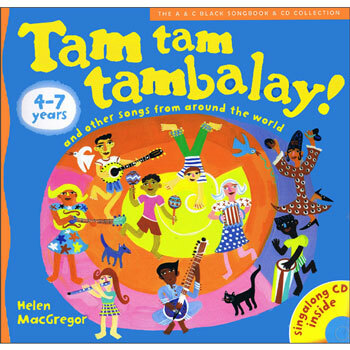 Tam tam tambalay is a collection of over 30 songs from all around the world that is supported by a wealth of musical developments and imaginative ideas for performance. The collection includes chants, echo songs, action songs and playground games, many collected in the field by the author, and also some popular favourites, such as I bought me a cat (USA), Bate bate chocolate (Mexico) and Funga alafia (West Africa). The book includes phonetic transliterations where appropriate and English meanings. Where relevant, songs will be provided in their original scripts (e.g. Gujarati, Japanese etc) on a website in pdf format so that teachers can download them as handouts or for use on a whiteboard. The CD includes sample performances of each song as an aid to learning and pronunciation, and there are backing tracks for easy performance. Melody lines are provided at the back of the book. Tam tam tambalay has been developed for use with children aged 4 - 7 years. An audio CD is included so no music reading is necessary and full teaching notes are provided.